Here's an overview of the kiln load, minus 2-3 small pieces. I had a high success rate, with a low occurrence of glaze flaws and warping. Yes, I did have 4 pieces that will need to be re-fired and/or scrapped. I also had some pieces with noticeable warping, and some periodic shmutz inside on the bottom. Salt firing will do that, and porcelain definitely has a bad reputation for going wonky. I think the bottom shelf in the back might have either been too cool or lost temperature too quickly during cooling, due to the peculiar glaze textures down there. 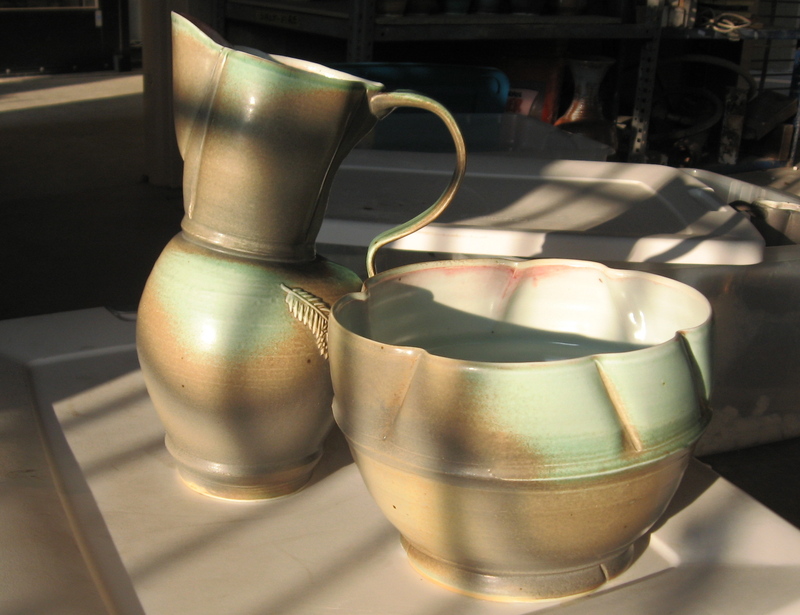 Nice pieces with a green hue characteristic of this glaze in a soda firing, which is a telltale sign that residual soda fumed in the kiln. At any rate, I was delighted by the brightness of the colors on many of the pieces. 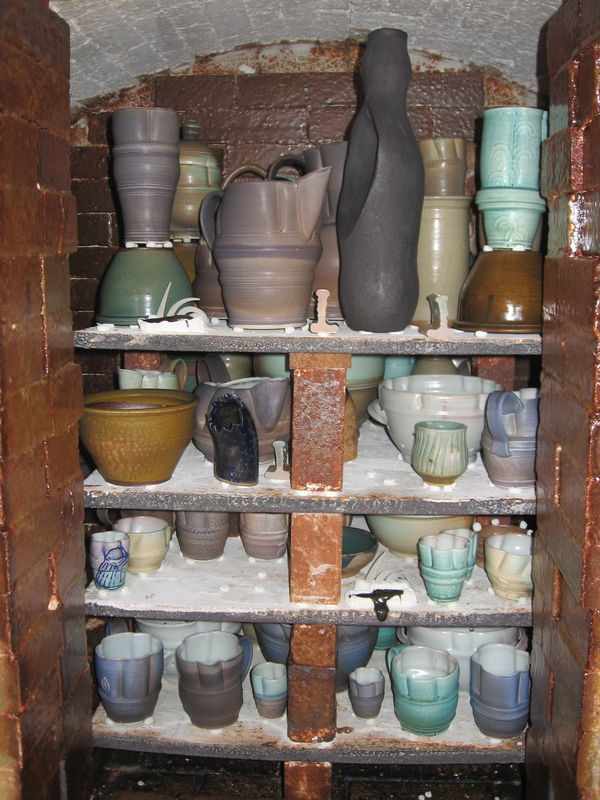 The previous firing in this kiln received soda treatment, and occurred during a recent Jeff Oestreich workshop. The residual soda is likely the culprit for the brighter colors, which I am thrilled about. That same soda did opaque my liner glazes more than I’d prefer. The Shaner Clear becomes positively satin in soda, so it ended up somewhere in between with this firing. Oh well, se la vie. Some Bright Green on the left, Chung Satin Blue on the right two, with a lot of atmospheric variation. 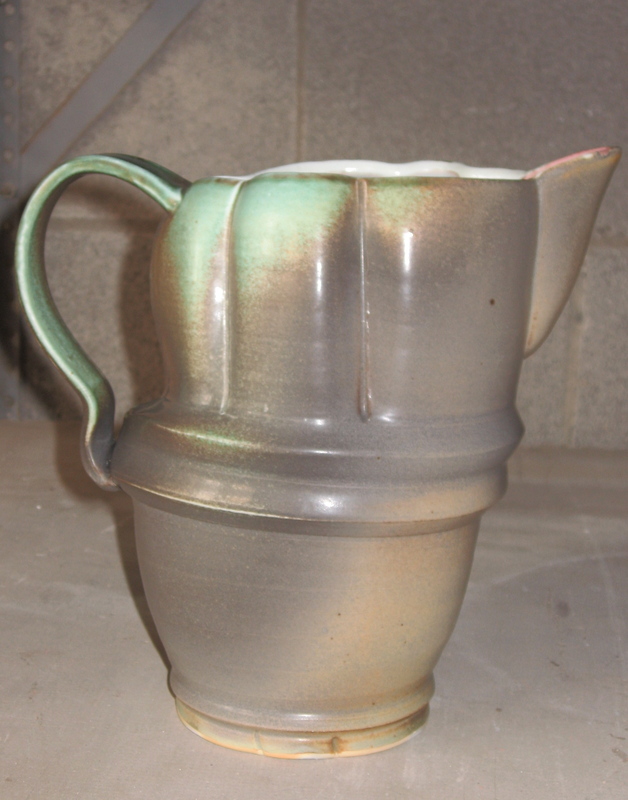 Ryan's Green-black glaze on a pitcher. An ideal glaze effect. Now that my general inventory is topped off, it’s time to fill a trophy order and create a set of narrative lidded boxes for a gallery show. I also need to catch up on making some plates. I plan to get out to a craft sale or some such event soon to clear some of the new stock, also. Until next time! I’ll be loading the kiln tomorrow, then firing this Thursday. Yay! Stay posted. I must say, applying glaze is my least favorite part of making pots. I am so meticulous and precise, that it becomes a sort of self-punishing process. I have developed a limited palette of my favorite glazes through trial and error, most of which might be mildly toxic in theory. 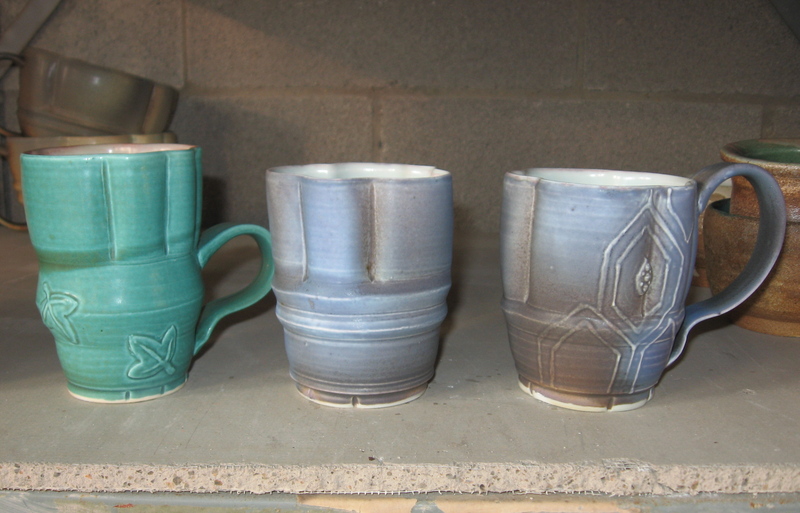 So I always play it safe and do the extra work to line the pots with a very reliable clear, celadon, or black glaze. Since I’m doing two glazes that division on the rim has to be just so: tight, clean, with minimal or no overlap. Which means tons of wax resist work and experienced pouring or dipping techniques which took me forever to learn. All of this = my personal hell. I know many potters who go the extra ten miles in their glazing (ex. 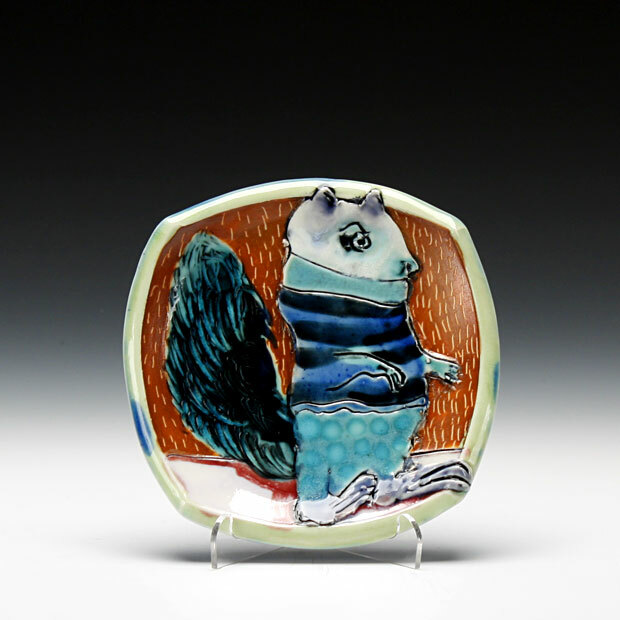 Bernadette Curran, see photo below), but I am not that potter. I want the form, decoration, and atmospheric variation to do the talking, and for the glaze to be simple enough to highlight rather than hinder. It’s worth the effort, though, because the more I put into glazing the better the results become. I strive to edit my extravagant taste down to what I believe is the essential elegant version, letting my visceral reactions to the work drive the decisions. I love satin surfaces that respond dramatically to atmosphere (be it salt or soda). Although black pot interiors speak to me, I have listened to my audience and the general preference is a beautiful transparent glaze to let the porcelain whiteness sing. Yes, I do the black liner some anyway. Then I choose to fire in salt or soda, so I can get that random magic to bring out the peaks and valleys of the form, and so much more texture (both visual and tactile). I’ve gotten 1/3 of my current bisque batch glazed. I should have all of it ready in 2 weeks at most, which is good because I love firing and I’m ready to get another lot pushed through. Keep an eye out for an update on the upcoming kiln opening. Yay! Here's a potter going the extra 10 miles with glazing. One of my favorites, always making killer work.